This one-way hike switchbacks from the scenic Glacier Point to the Yosemite Valley floor with wonderful vistas on the way down. After exploring busy Glacier Point and its incredible views, find the Four Mile Trail that takes off to the west. It initially travels level through an airy forest of large trees before opening up to an expansive view looking west over Yosemite Valley. The switchbacks begin as the trail steeply descends into the valley. The trail bounces between trees and shrubby, manzanita-filled areas. Take the short side trail out to Union Point for a great vantage of Sentinel Rock. 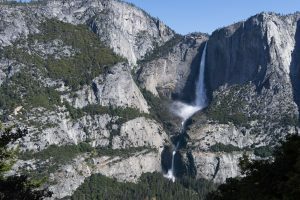 The entire Yosemite Falls is visible from this area including the cascading section between the upper and lower falls. The trail continues through a seemingly infinite amount of switchbacks, with changing vantages of the valley below, as it drops into the oak forest and eventually the Four Mile Trail trailhead at the valley floor. A longer, 13.9mi/22.4km hike involves hiking up the Four Mile Trail and down via the Panorama Trail (see Four Mile and Panorama). Trailhead: Take the fee-based hiker’s shuttle up to Glacier Point (or arrange your own shuttle). 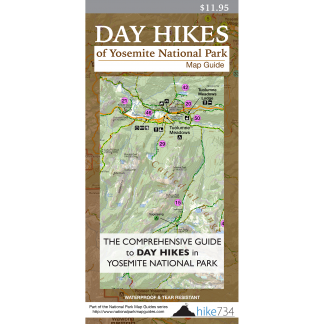 If hiking up to Glacier Point, park at the small parking area at the signed trailhead, or take the free bus shuttle to the Four Mile Trail shuttle stop E7 on the El Capitan route.